This post is a continuation of the epic Northern California road trip I took in June. You can read the beginning here. 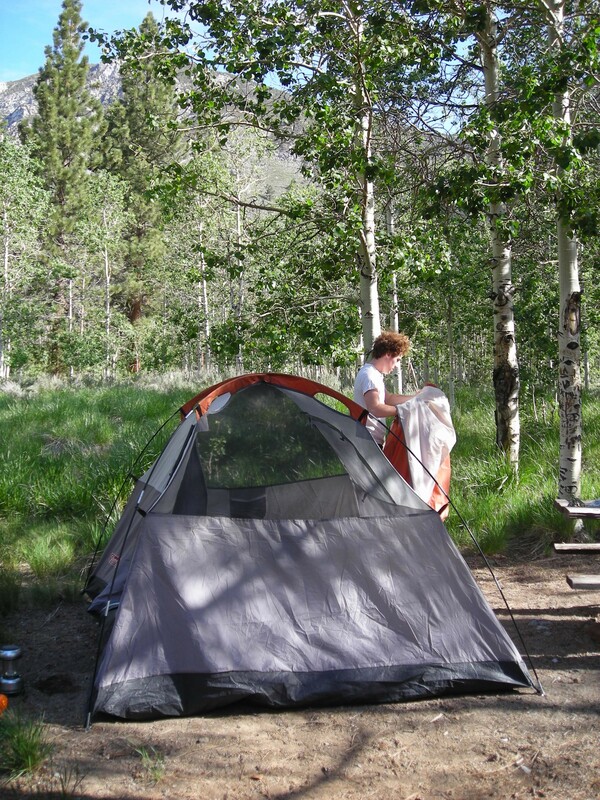 We awoke on the second day in our tiny tent in the middle of the gorgeous, forested Lee Vining Canyon. One thing I really like about camping is that it forces me to get up earlier than I usually do and take advantage of all that the day has to offer. Case in point, we felt as though we’d had a major lie-in, but it was only 8:30 am. It was also beginning to be warm already, something that I’m not used to anymore after moving to San Francisco. I know the rest of y’all are having a heat wave, but it’s fog city at my apartment right now. We lingered a bit at our campsite before packing it in and driving the short distance to Mono Lake. Mono Lake is incredible. It is one of the oldest lakes in North America, and one can really feel the age of the place when there. It is vast, still and colorful, with volcanoes and islands and these weird tufa towers rising out of it’s depths. 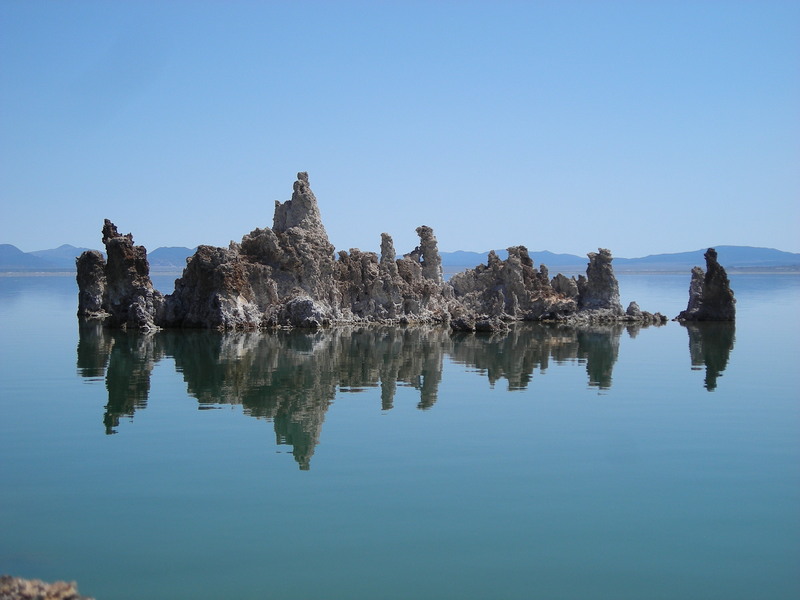 As Wikipedia puts it, “Tufa is a variety of limestone, formed by the precipitation of carbonate from ambient temperature water bodies”. You can read more about it here if you are so inclined. Although the lake is incredibly alkaline and looks creepy and prehistoric, it supports a thriving ecosystem and is a popular stopover for migratory birds and waterfowl. 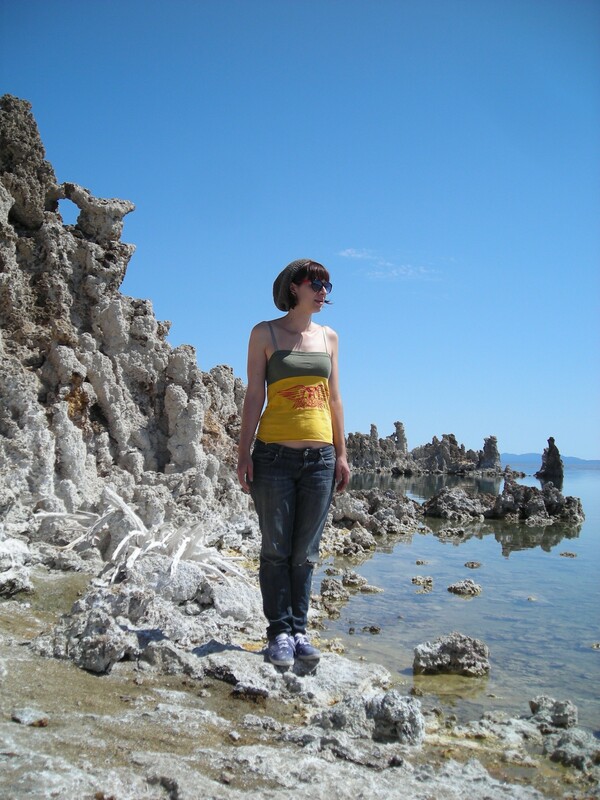 While at Mono Lake, we visited the South Tufa Reserve, which costs $3 but is amazing and absolutely worth it. There is a loop trail down to the water filled with shrubs and tufa formations that get increasingly stranger the farther you go. The beaches at the tufa reserve are also incredible and we had a great time exploring, except that we kept trying to escape a group of annoying tour guides-in-training that were hovering about. 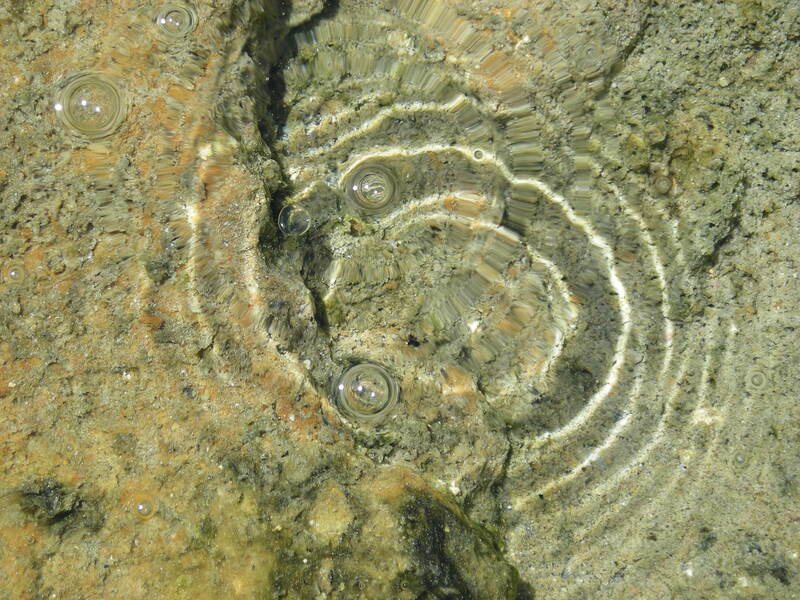 At the shore of the lake, peering into the shallow water, one can see alkaline shrimp swimming and tons of flies that scatter when one moves towards them, as well as bubbles that indicate fresh water springs coming up from the depths. 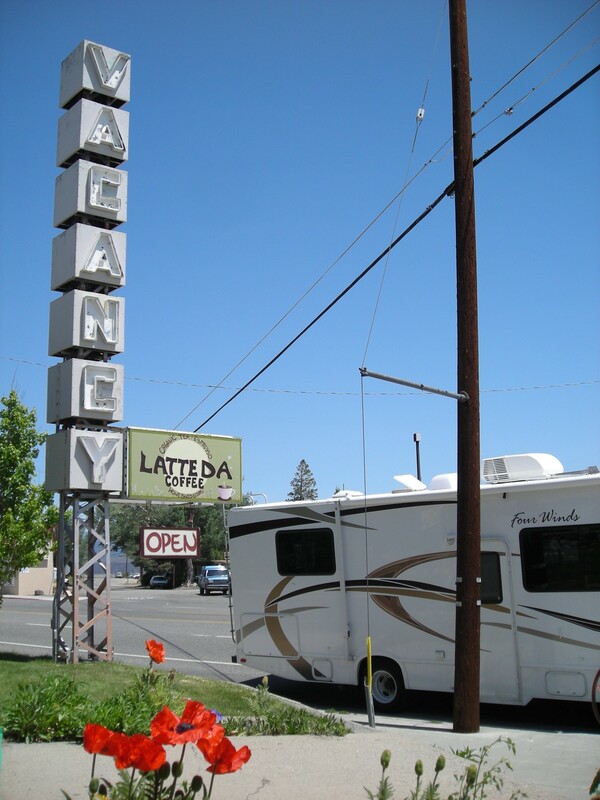 After we’d had our fill of the uniqueness of Mono Lake and it’s wonders, we got back on the road but stopped again back in Lee Vining for gas and a coffee break at the Latte Da Cafe. The young guys working there were our kind of people. One had long curly hair like Zac, and the other was playing Bright Eyes on the stereo and truly appreciated when Zac complimented his musical choice. I think we would have all been friends if we also grown up in that tiny town (population 398). But soon it was time for us to be on our way, and on to the next weird and wonderful attraction. 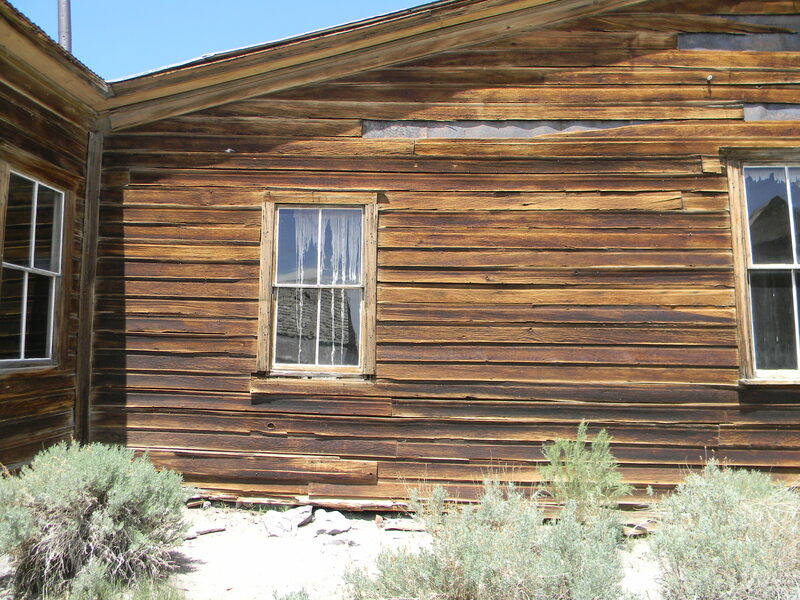 We drove up highway 395 but got on the 270 and drove the 13 miles to Bodie. Bodie is a California ghost town preserved in a state of “arrested decay”- meaning that it has been preserved and restored, but most of the buildings and artifacts are the same as when it was recognized as a National Historical Landmark in 1962. 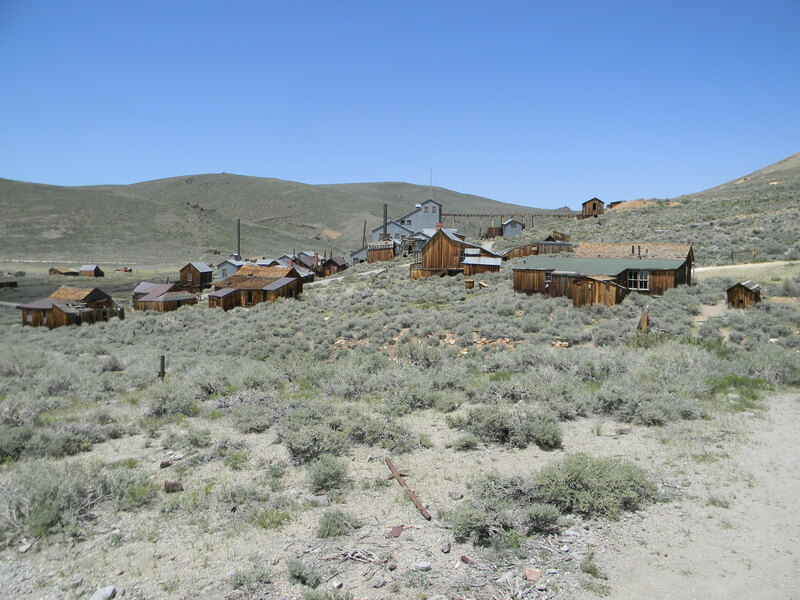 My sister Mel visited Bodie a few years ago, and after hearing about it and seeing her photos, I’ve always wanted to go. 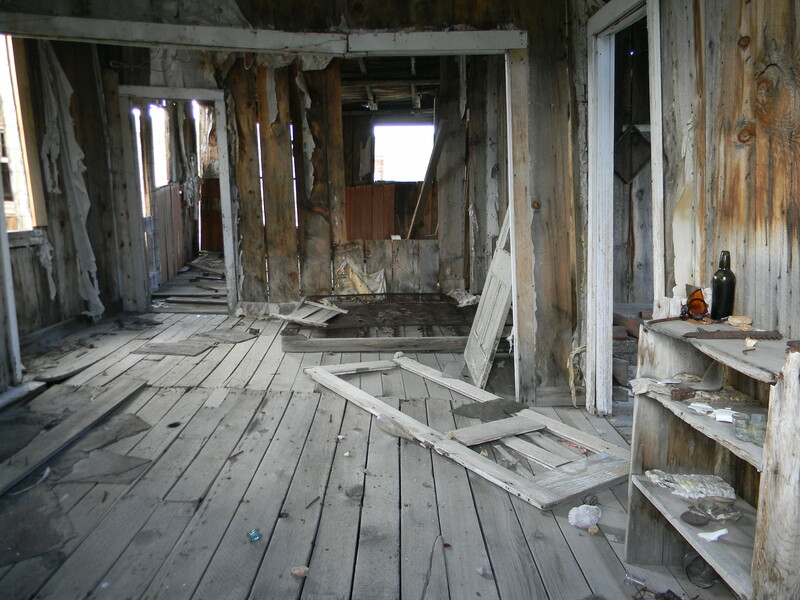 The minute that the weather beaten, dilapadated buildings of Bodie were in sight, I got very excited. We paid, parked, and spent the next 2 1/2 hours exploring the decaying houses, peeking in windows, taking pictures, and wandering the quiet streets. 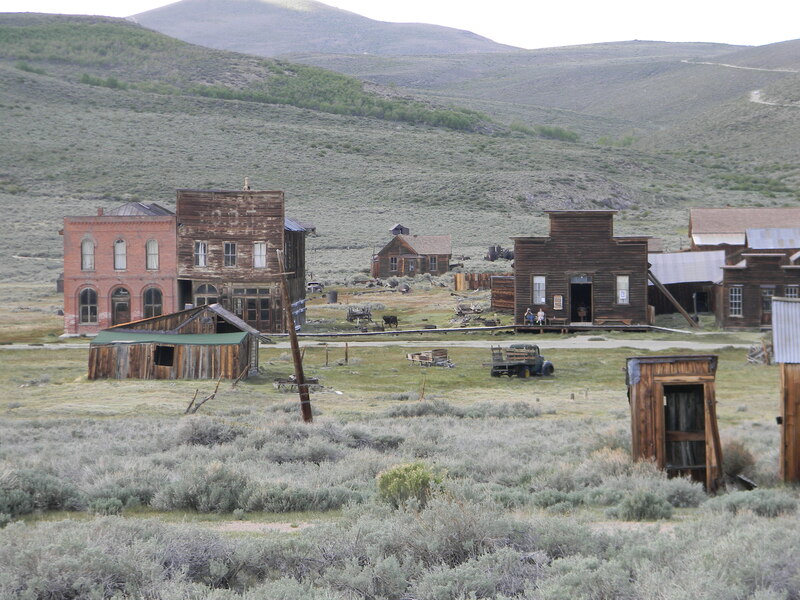 The magic of Bodie is kind of hard to explain. In it’s heyday, it had over 10,000 inhabitants and was one of the wickedest places in the west with 65 saloons and daily brawls and frequent killings. Today only 5% of it’s buildings remain, with the last inhabitants having left in the 1940’s. Time and the dry, brutally windy climate have taken their toll on the buildings and possessions left behind. To preserve them as they are, the doors and windows are locked, but visitors are encouraged to look in the windows. The sights inside are ghostly. Wallpaper is yellowed and torn, sagging and hanging in strips. Beds are stained and rotting. Dirt and dust is everywhere, and some rooms are simply filled with piles of boards and mysterious broken and rusty items. Although it is true that the former inhabitants left many items, taking with them only what they could carry, many rooms seemed a little too artfully arranged. 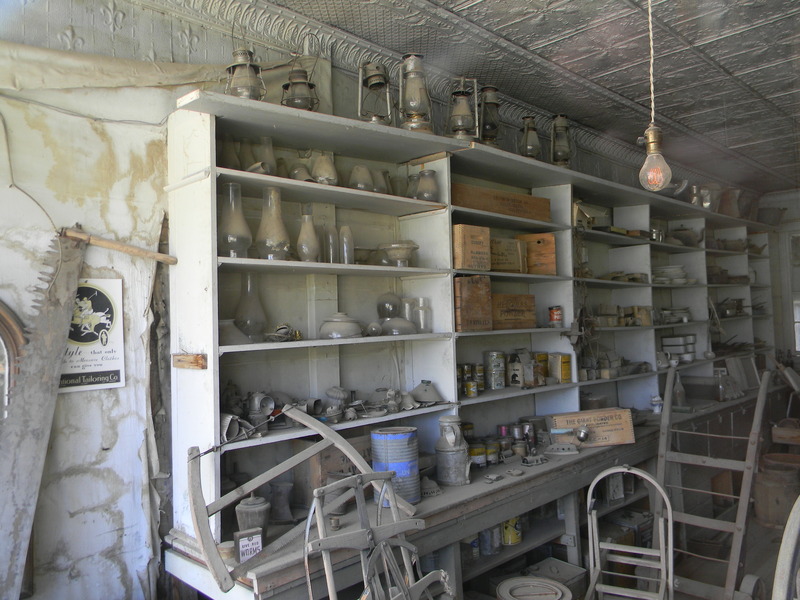 I suspect that when Bodie was being preserved in the 1970’s that items were placed so as to be more in view to visitors peeking in the windows. Who left the light on in the general store? My favorite places were the general store, school, and boarding house. I’m such a history nerd, and couldn’t help imagining what it would have been like to walk those streets for real, stay at the boarding house in the room with the blue flowered wallpaper, or go to the general store for supplies. There was also a museum that had tons of personal artifacts, including opium paraphanelia from the Chinatown next to the red light district. We did visit the Chinatown, but all that is left are two one-room shacks. 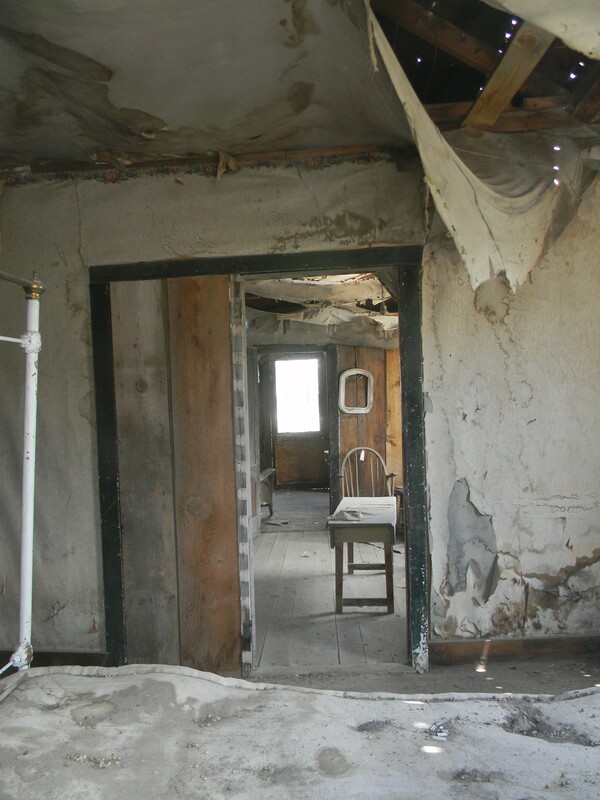 Apparently the Chinese workers in Bodie had much simpler residences than the other townsfolk. I also bought a shot glass in the museum from a grumpy old docent. It seemed a fitting souvenior. Before too long, it was time to be moving along again. We still had a 4 hour drive ahead of us to our final destination of Nevada City. We drove further up highway 395 than we’d gone before, between majestic mountains alongside a rushing river. It was about an hour before we made it to the Nevada state line. Now, for those unfamiliar, Nevada City is actually a town in California, not Nevada. 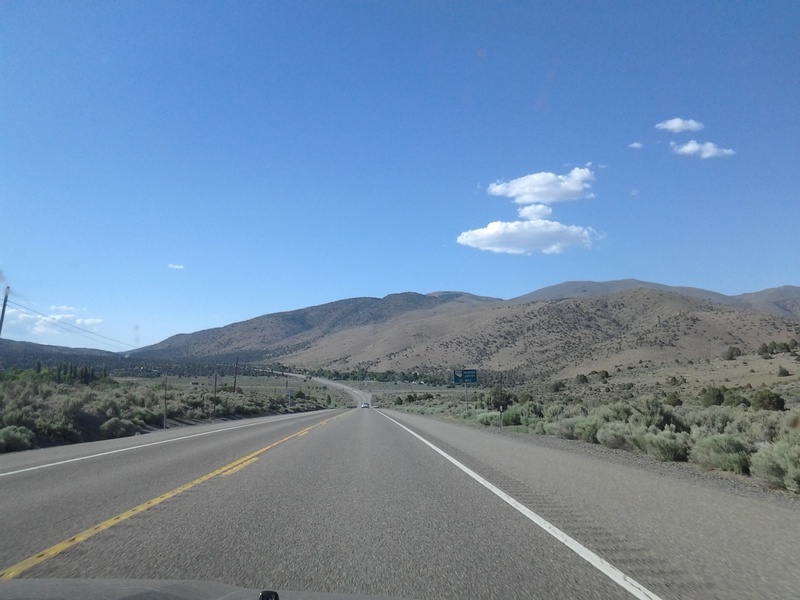 But ironically, when driving from Mono Lake to Nevada City it is actually quickest to pass through the state of Nevada. I was really excited about driving through Nevada. I’d never driven across a state line as an adult. I don’t know what I was expecting, but it happened very quickly. At first Nevada didn’t look any different from California, but then we started to notice things: different-looking street and freeway signs, casinos, billboards. I couldn’t remember the last time I’d seen a billboard on our trip, the territory we were in was so remote and rural until this point. The terrain got flatter, hotter, more redneck and suburban. Not very pleasant, really. We did however take advantage of the cheaper gas in Nevada and filled our tank. 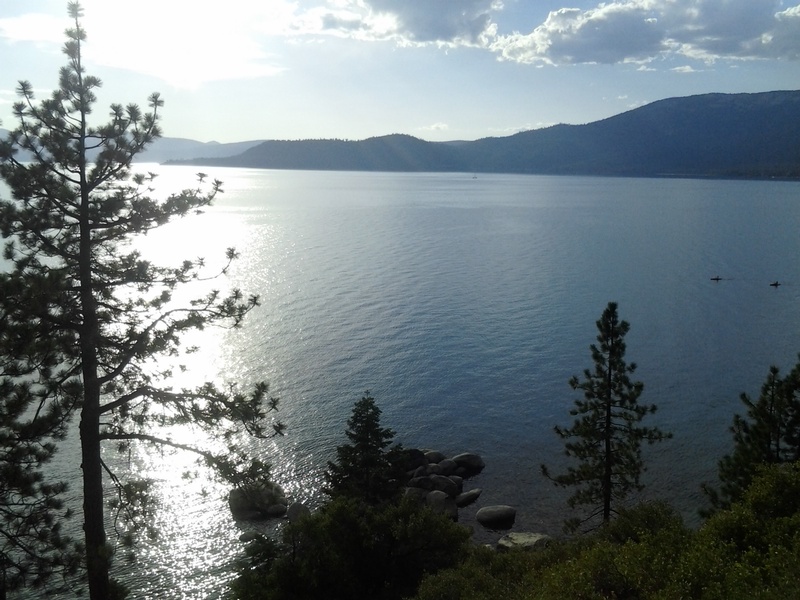 We we drove by Lake Tahoe, however, the scenery became beautiful again, mountainous and woody, the road windy. We stopped at a viewpoint that took our breaths away. It really is a beautiful, giant lake. It’s such a common destination, and now I can say that I’ve been there, even if it was just driving around the perimeter. Our passing back into California north of Lake Tahoe was uneventful, but better marked. We got on highway 20 bound for Nevada City. That was an awesome drive. You could only see the road directly ahead because of the thicket of trees on either side. We stopped briefly in downtown Nevada City to pick up a pizza from Pete’s Pizza Parlor and went on to meet our Couchsurfing hosts, Stu and Mags. Zac and I have done our share of Couchsurfing, and know that the sleeping/house situation can vary widely. Stu and Mags’ house was by far the nicest Couchsurfing accomadations we’ve had. They own an actual 2 story house in the Nevada City co-housing complex, with a big kitchen and nice furnishings and a gorgeous patio overlooking a tiny creek. They were also bunny-sitting four rabbits during our visit. 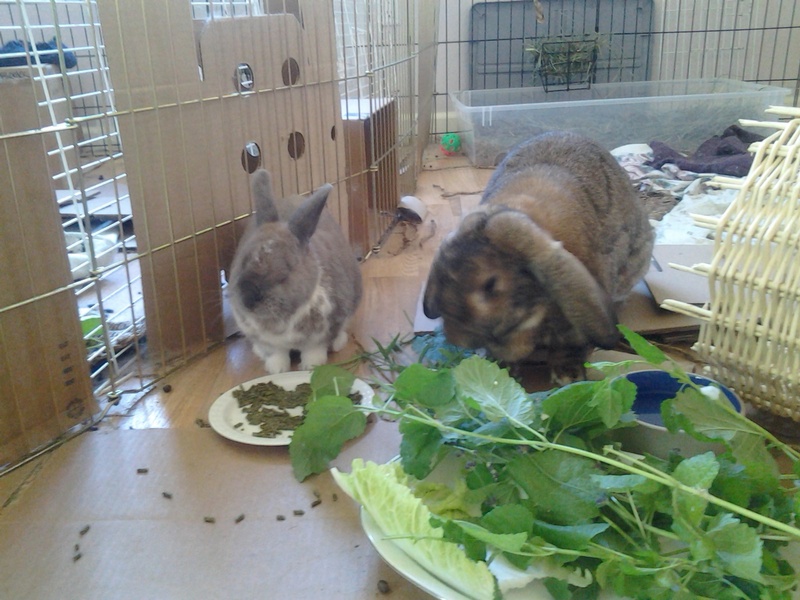 The bunnies’ elaborate setup took up a good portion of the living room. After we arrived, we ate our pizza and chatted with them, and I tried to contain my joy over sharing a house with four bunnies. Stu and Mags are interesting people. They actually met and lived in San Francisco for a long time before taking a year to travel and decide where they wanted to settle. They’re criteria was someplace more affordable than the bay area where they could pursue their passions, urban farming for him and a path in physical therapy for her. They retired early so since she had a meeting in the morning and he goes to the farm. As Zac wrote letters, I lay on the Murphy bed in their spare room, listening to the bunnies and pondering our good Couchsurfing fortune. Tomorrow would be another day of fun and adventure. . .